LPC – Lahore :Sherwood emerged as Polo in Pink 2017 winners after trouncing Guard Group by 8-3 in the final played here at the Lahore Polo Club ground on Saturday. Shaukat Khanum Cancer Hospital sponsored the event, which was the first major activity of this polo season 2017-18. The final started with Sherwood having two goals handicap advantage which was further enhanced by Shahzad Aziz who struck a field goal while from Guard Group, Taimur Ali Malik converted a 40-yard penalty successfully to finish the first chukker 3-1. Sherwood then fully dominated the match as they hammered tremendous three goals to stretch their lead to 6-1. The goals came from Shahzad Aziz, Adnan Jalil Azam and Faisal Khokhar hit one goal apiece. From Guard Group, the only goal came of second chukker came from Taimur Ali Malik to reduce the lead to 6-2. The third chukker saw one goal each coming from both the sides to make it 7-3 as from Sherwood, Frasat Ali Chatha was goal scorer and from Guard Group, Mian Hussain Iftikhar converted the goal. Sherwood struck another goal in the fourth and final chukker through Frasat Ali Chatha to finish the final having 8-3. 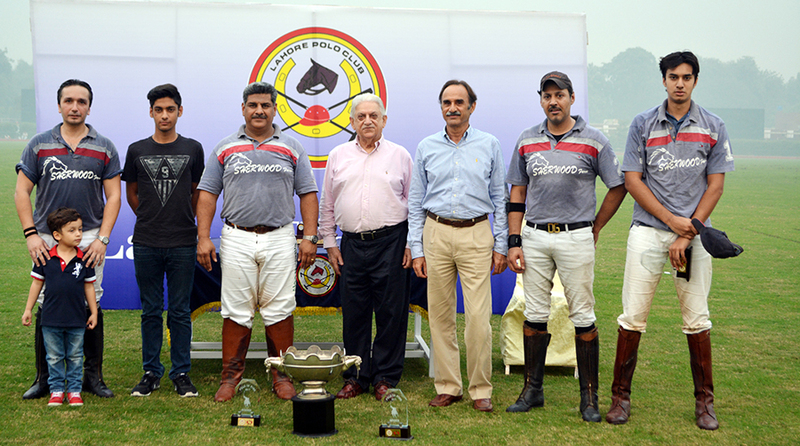 The subsidiary final was won by Total Nutrition 6½-4 against Black Horse Paints. Female polo player Raqia Mansoor and teammate Bilal Haye were stars of the day as both thwarted three goals each for the winning side while form the losing side, Abubakar scored a brace while Fahad Noon and Mustafa Monnoo hit one goal apiece.